← A cruise on the Onrust. Heading “Home” to the CT River Museum. Can a ship be cute and rugged? It’s Friday morning and the sun is out. Brenda and I plan lunch at a nearby vineyard as a sort of post anniversary (ours) and birthday (mine) outing in our little red car. The vineyard is Priam and they have picnic tables outside where you can bring your own lunch and enjoy a bottle of their wine. It’s a very pretty place. I mention this as it’s during the warm months that Pandora is put to bed and we focus on land themed activities. And speaking of land, well sort of. 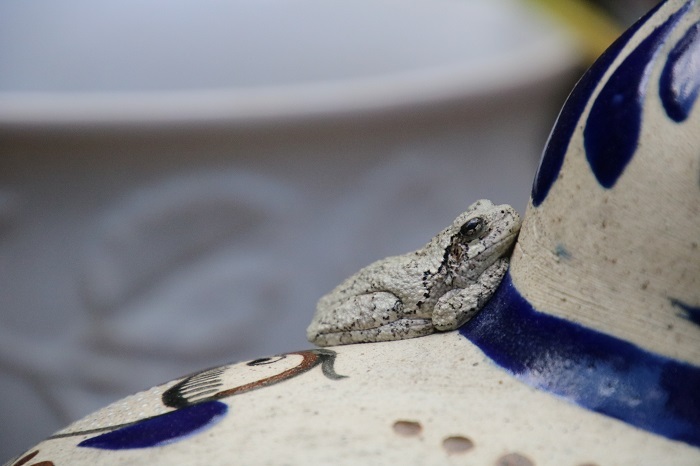 This little tree frog is visiting us as in past summers. We have named him Vilado. Not sure why, that’s just because he looks like a Vilado. Right? 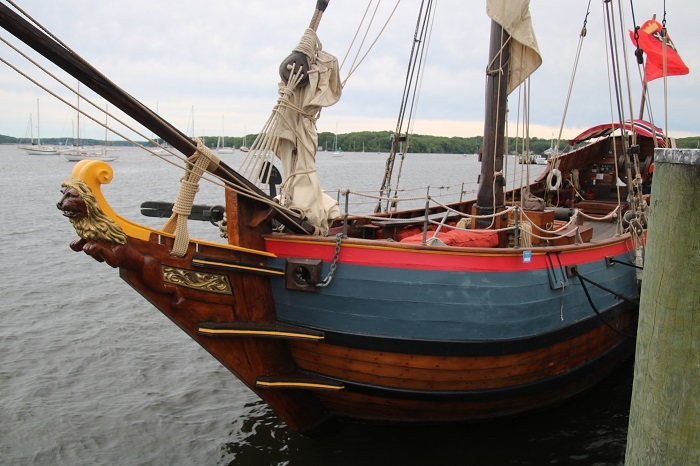 Whatever… Pandora’s still in Hampton and I’ll be bringing her north at he end of the month and then she will be hauled for 6-8 weeks. 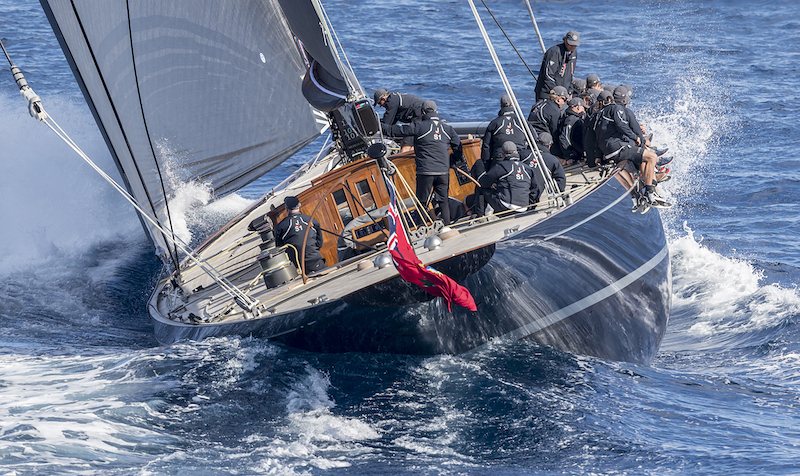 I plan on splashing her again in time to go to Newport for classic J yacht racing in late August. I understand that there will be 7 racing, the largest number ever to share a course. 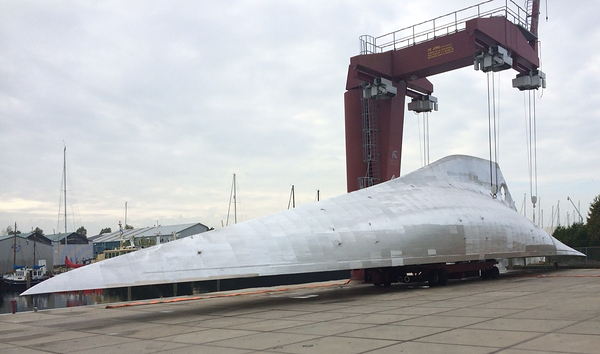 Amazingly, these boats continue to be built and from original plans. The most recent one, Svea, launched in the Netherlands, built from plans that were drawn up back in the 30s but never built. She’s massive. No mistaking that this is a game that can only be played by the “big boys” who can afford “big toys”. A picture of power in every way. It will be fun to see her and the others in Newport later this summer. Until then I am focused on more humble but perhaps no less important vessels closer to home. I had written about a recent arrival at the CT River Museum, the lovely Onrust. 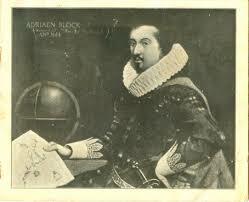 She’s a reproduction of Adrien Block’s 17th century ship, the first European ship to be built in the new world. 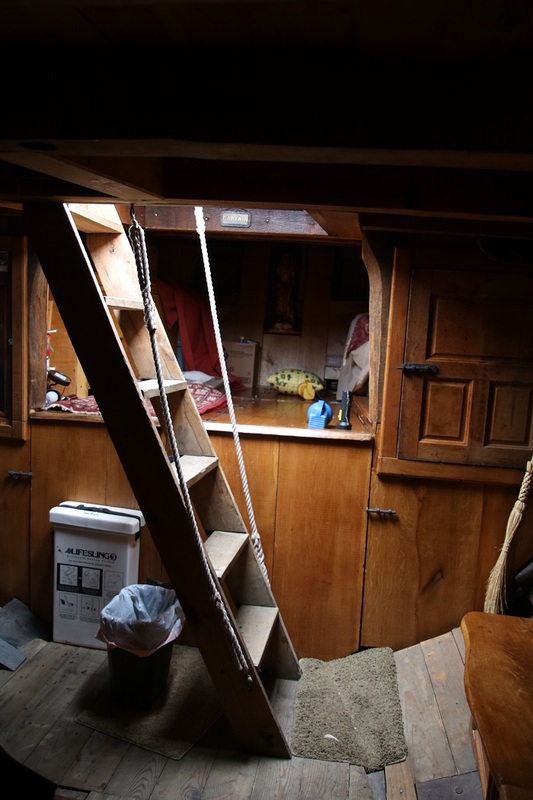 His charts were remarkably accurate for someone who didn’t have any way to view things except from the deck of his little ship. 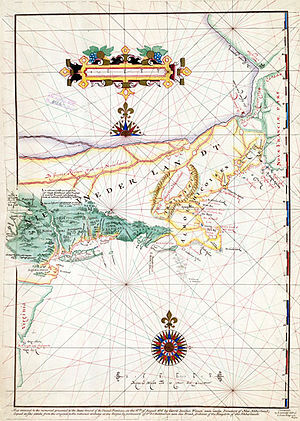 This chart by Block covers the area from the Delaware north through New England. Not bad for a guy from the 1600s. Block himself looking like he’s ready for anything. Love the PFD. Ok, perhaps It’s a collar. Doesn’t it look like a PFD? Actually, I’m thinking that he didn’t wear one, a PFD that is. However, he did get around plenty. 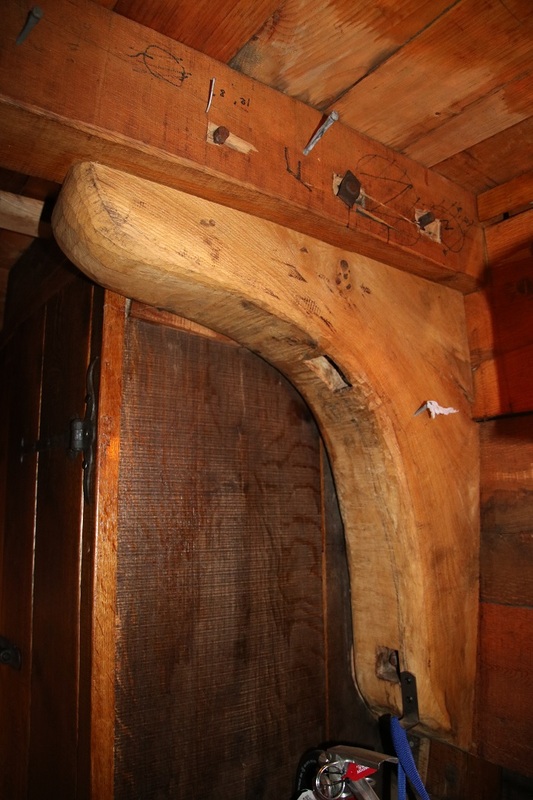 Now that the Onrust, the replica of Block’s ship, is in Essex, I couldn’t resist visiting her and taking some detail shots of her construction. She’s small but tough as nails. Probably much like Adrian in spite of that wacky collar. However, I wore a powder blue tux with dark blue piping and a ruffled shirt to Brenda’s and my junior prom so who am I to judge? Anyway, Block was an impressive guy and I am just loving the Onrust. 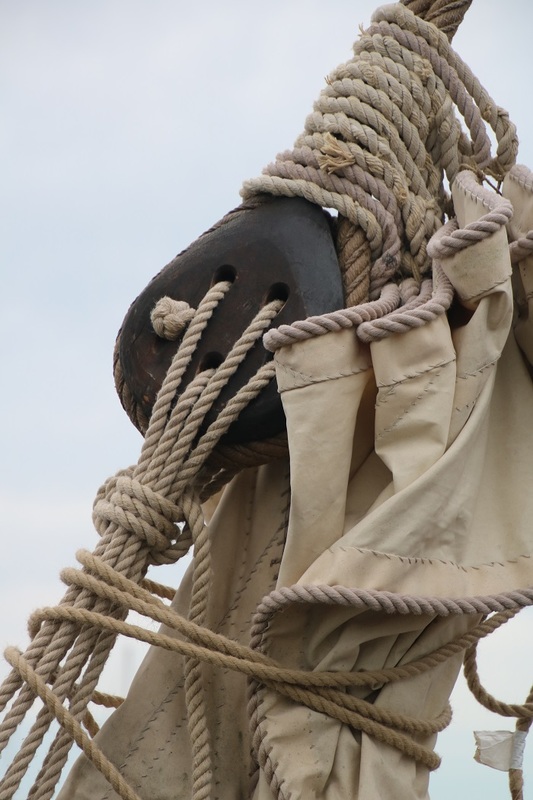 So, I took a trip down to the CT River Museum, where the ship is for this season, and took some photos of some of her details. I wrote about her in a few prior posts so if you just scroll down below this post you will see them. What comes next, may be, as my Dad used to say “more than you want to know about penguins” but here goes. 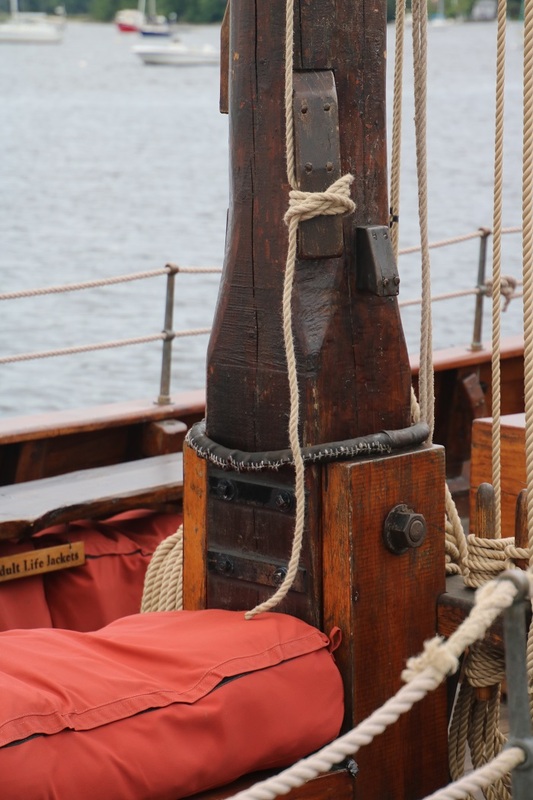 Nice attention to detail on the mast. 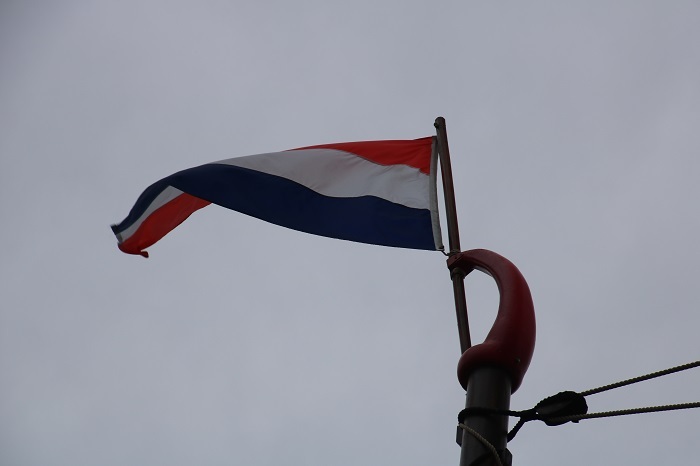 No power winches on Onrust. 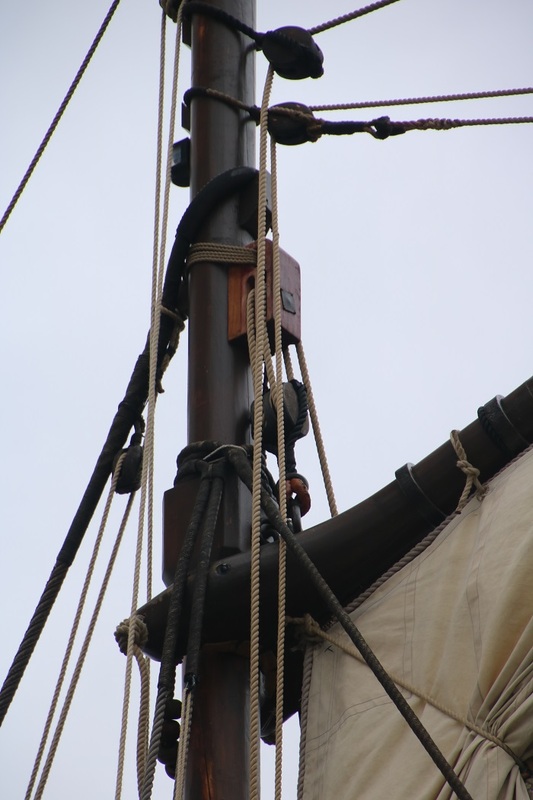 How about the detail at the top of the mast? I expect that there is a story about that too. 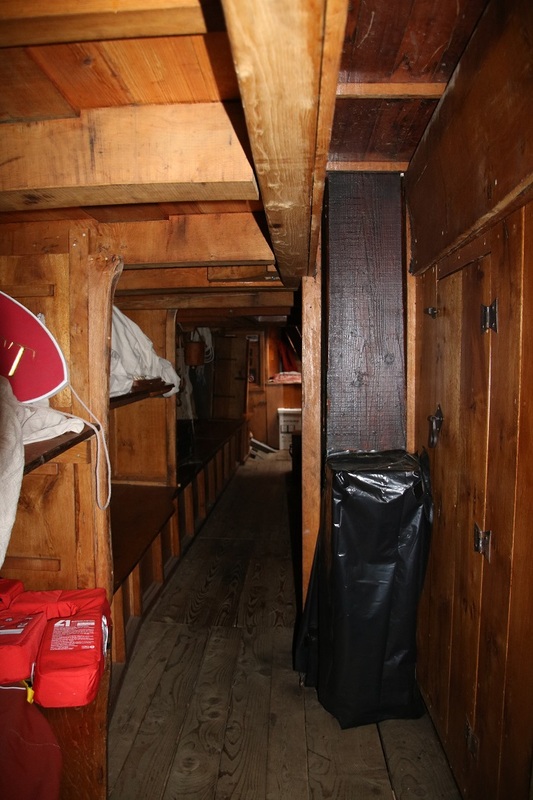 The mast has a tabernacle so it can be easily laid down on deck. That’s a nice feature for ease of work aloft. No crane needed. 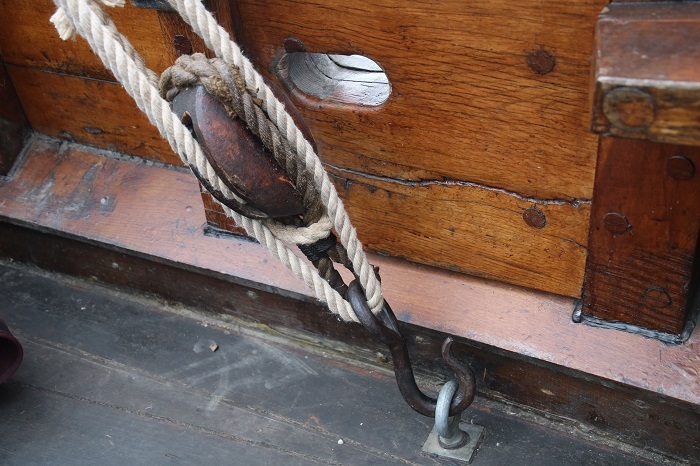 All of the hardware was forged by hand, including this really nice hook holding the running backstay. Sort of a “olden day” soft shackle, I guess. You know, the type made out of Spectra? 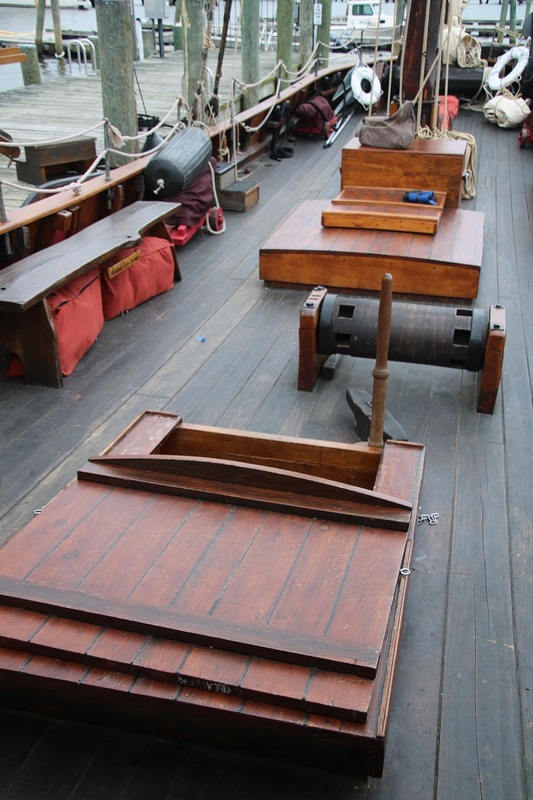 The deck area is set up for lots of folks on board. 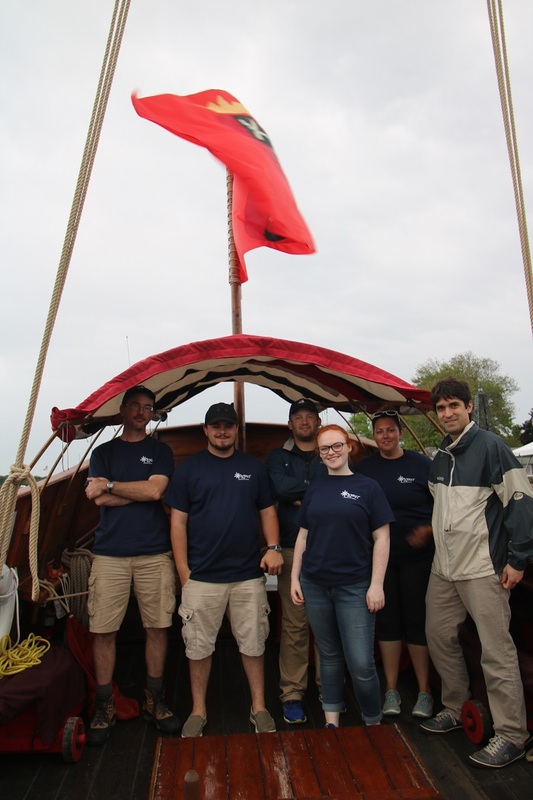 The original Onrust sailed with a crew of dozens I expect which would have been pretty crowded, open decks or not. Consider that the original vessel was built in the dead of winter in only four months. Those guys were really tough anyway so close quarters were just the way it was. 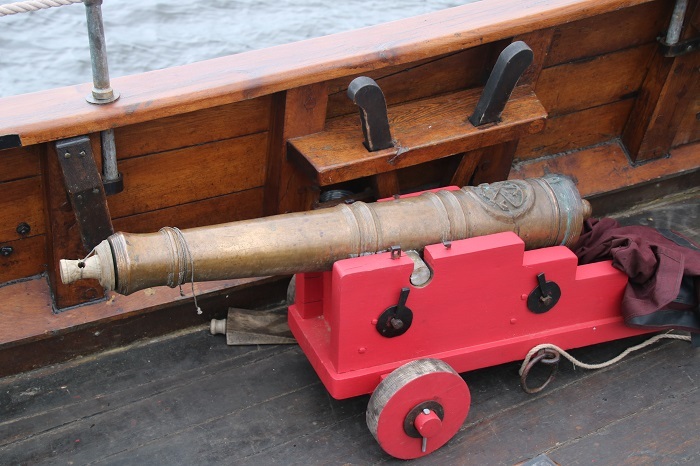 She’s well armed with some really nice bronze cannons and they really work. I saw/heard one on my “voyage” aboard from Old Saybrook. They too have some nice little details. I’m sure that there is a story here too. 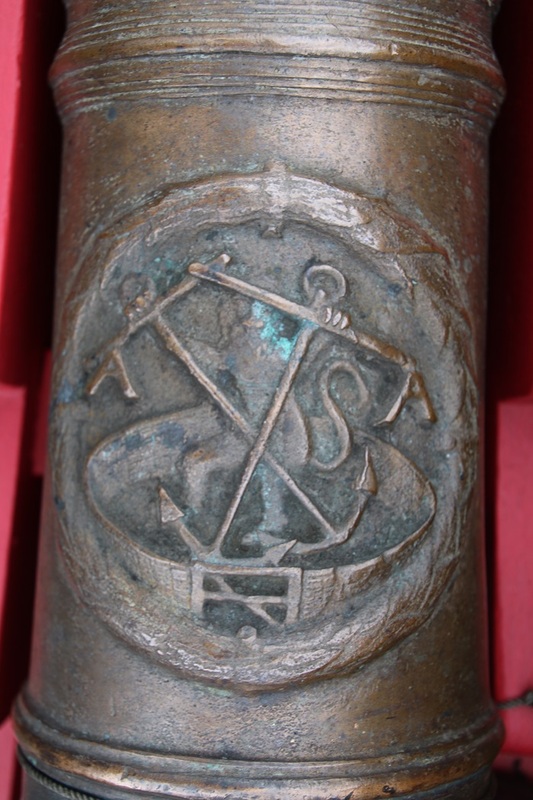 A monkey and anchors? Lot’s to see down below. 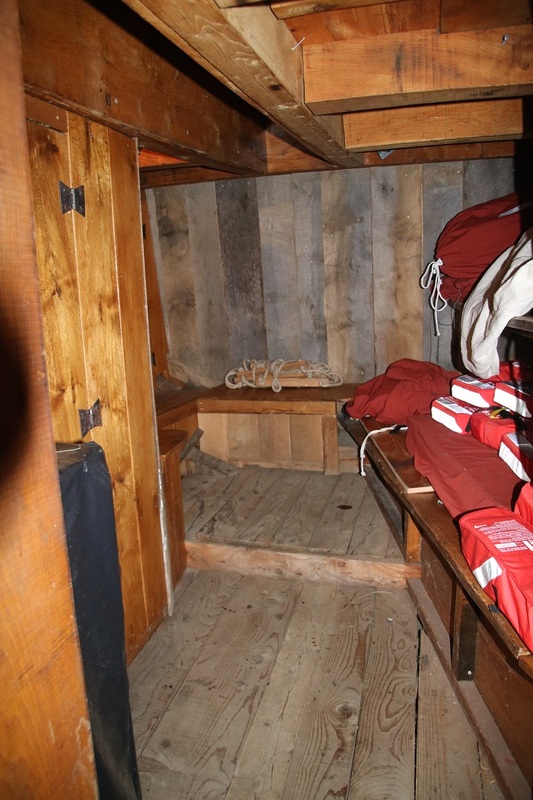 Certain accommodations have been made in deference to her current use and certainly for the USCG. Back in Block’s day, this would have been cargo only. I guess that Block’s crew would have slept on top of well, whatever was in the hold. 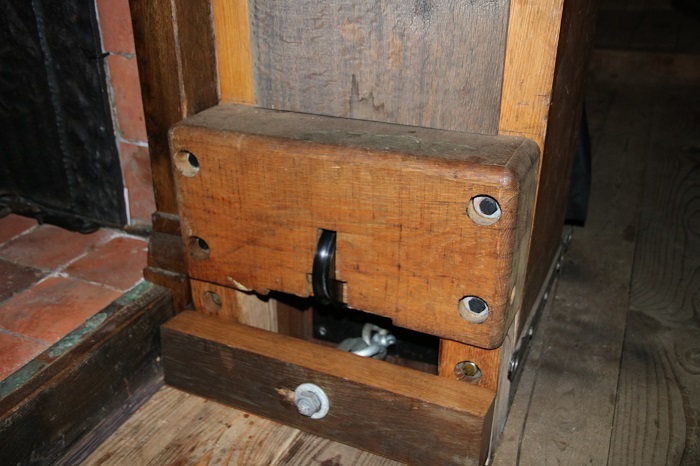 Lots of nice detail work like this well fashioned knee holding up the deck. 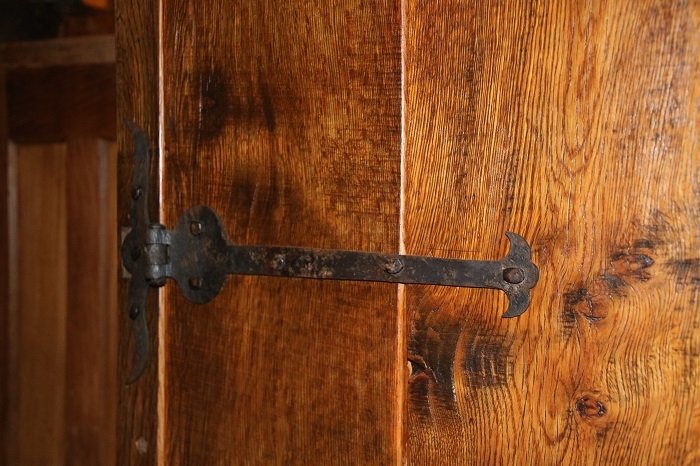 Great hand forged hardware. The wood is well finished but not fussy. 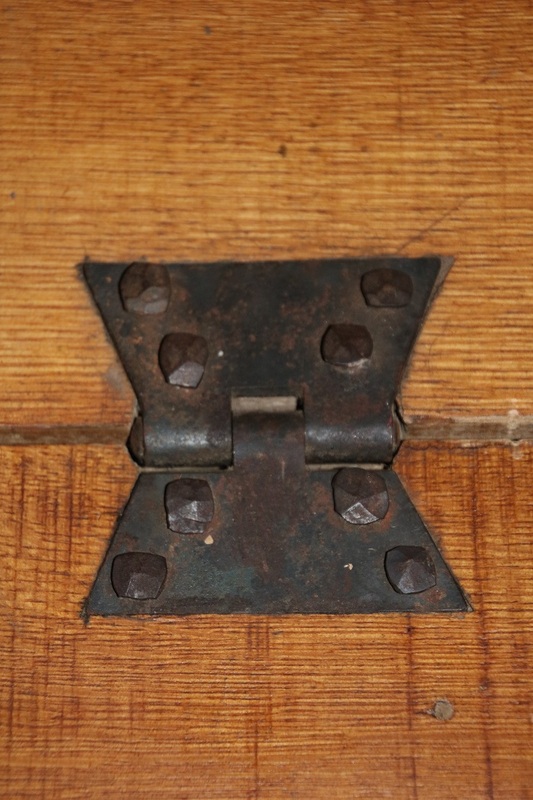 Nice hinge, complete with cut nails. Hand forged nails? Probably. A view of the forepeak. And a view aft. In case the crew get “soft” no cushions on the bunks. 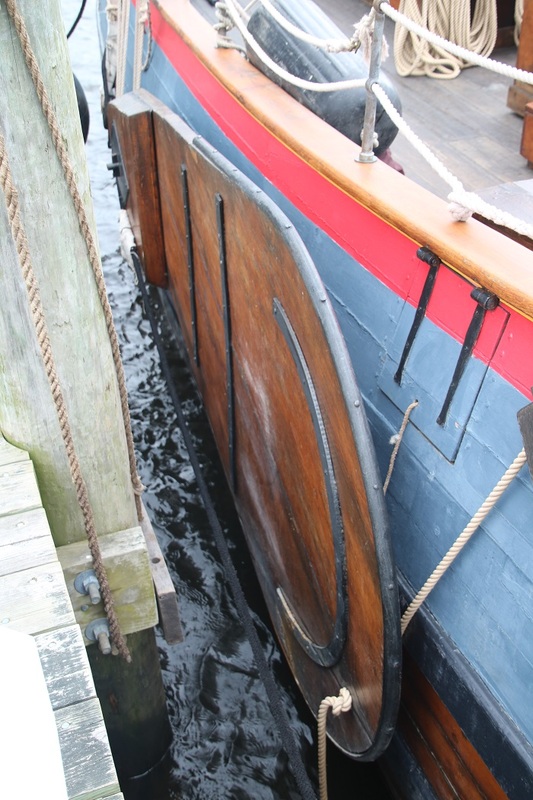 Don’t know what this is at the base of the bulkhead aft of the mast but it’s really, really sturdy. I’d have thought that it was for a centerboard. However, she has lee boards. And, here’s one of them. 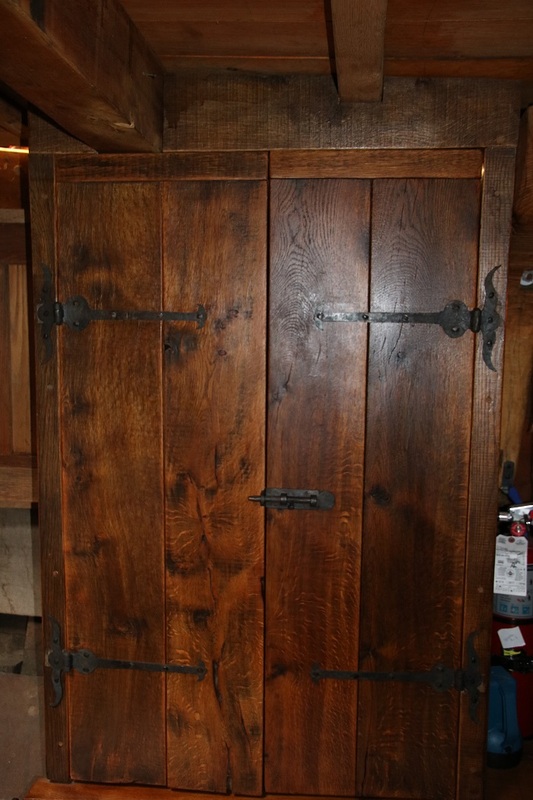 From a construction standpoint, it’s a lot easier to make these than a centerboard. A boat with lee boards can also ground out easily with no damage. I guess a logical place to finish up is of a shot of her crew. “Aargg. 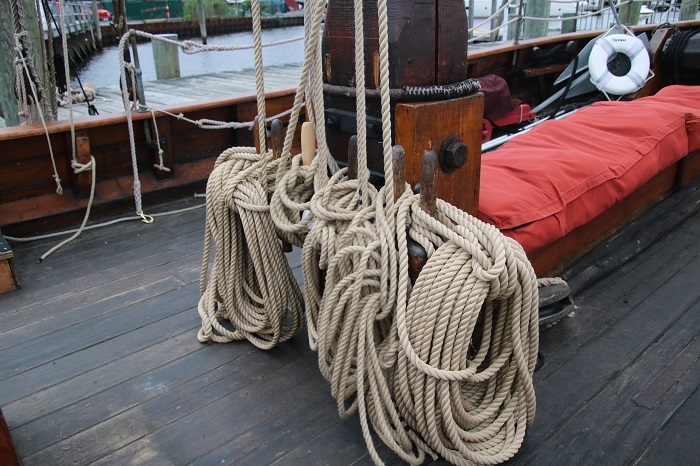 Hoist the main brace! 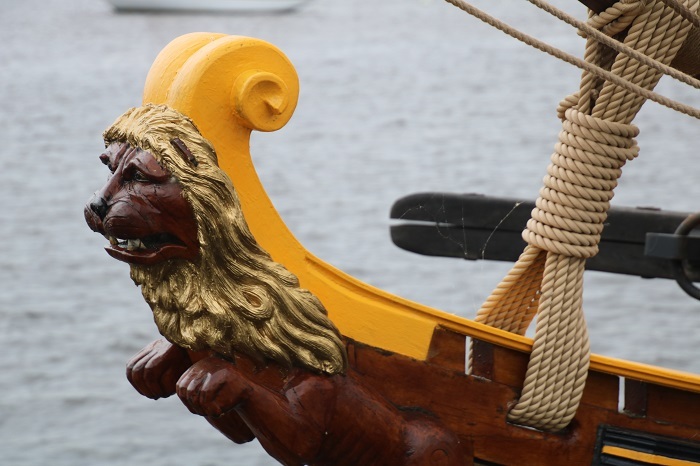 And be quick about it, you scallywags!” All, and all, the Onrust is a charming, dare I say cute, little ship? However, like her “father” Adrien Block, she’s tough, that’s for sure. I can’t wait to go out on her again. Yes, I guess you actually can be cute and tough. Oh yeah. Want to go for a ride? You can. Contact the CT River Museum. You’ll be glad you did. Beautiful pix Bob and great article! Thanks so much. I certainly look forward to seeing her when I get back.